Most of my renders start out as scenes that I model using Sketchup. 3D modelling is therefore incredibly important to my workflow and the services I can provide. Whilst most of my modelling is undertaken in order to create renders I am available to model objects, products or buildings to commission. Please contact me if you want to discuss your modelling needs and require a quote for my services. 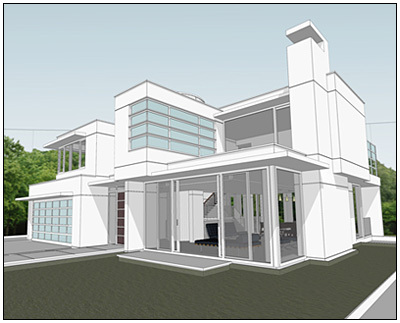 Most of my architectural renders are based on either images of architectural plans or CAD drawings. Basically this means that I understand how to read architectural plans and elevations and I'm familiar with the process of translating these plans into three dimensional structures. I'm happy to take on most project - small or large - from kitchen conversions or house extensions, through to fully landscaped models for new house builds. Examples of my architectural models can bee seen in the renders featured in my Portfolio. You can view and download a small selection of my modals from the Free Models library on this site. In addition, I created most of the models used to produce the renders seen in my Portfolio.